The crested gecko is something of an unusual gecko both in appearance and in the fact that it was once believed to be extinct. This unique looking gecko is protected as an endangered species, yet it remains popular in the pet trade. In this article we will cover everything you ever wanted to know about this species including taxonomy, physical description, behavior, life in captivity and more! What is the Crested Gecko? The crested gecko actually goes by a number of different names including the new Caledonian crested gecko, Guichenot’s giant gecko and the eyelash gecko. Most commonly when not being referred to as the crested gecko, this lizard is known by the name “eyelash” gecko because of the appearance of it having long eyelashes. The eyelashes of the crested gecko are not actually hair but these projections above the eyes resemble the appearance of eyelashes hence the name. The crested gecko or Rhacodactylus ciliates is a member of the Rhacodactylus genus in the Gekkonidae family of the Squamata order in the class Reptilia. As a member of the class Reptilia, the crested gecko is characterized by the ability to breathe air and lay shelled eggs. In addition, these reptiles are also characterized by having scaled skin. These tetrapod creatures are recognized for the most part as being cold-blooded or ectothermic. As ectothermic creatures crested geckos depend upon external means of controlling their body temperatures which is why they are often seen “sunning” themselves. The metabolic rate of creatures that are cold-blooded is slow. There are currently four recognized orders of the class Reptilia: Crocodilia, Squamata, Testudines and Sphenodontia. The crested gecko is a member of the order Squamata. Animals found within the order Squamata are plentiful. In fact, it is the largest of the orders within the reptile class with some 7,900 species. The order Squamata includes not only lizards but also snakes and worm lizards as well. Animals in the Squamata order all present with either shields or horny scales on their skin, they are also known for having movable quadrate bones which allow them to eat prey which is larger than themselves. The smallest recognized member of the order Squamata is the Jaragua Sphaero that measures in at .63 inches. The largest recognized member of the order Squamata is the green anaconda which has been known to measure in at 26 feet long. While the green anaconda is currently known as being the longest of creatures within the order Squamata it is not the longest to ever have lived. The longest creature in the Squamata order to ever have lived was the giant mosasaur which often measured in at over 46 feet long! Traditionally the order Squamata is divided into three suborders: Lacertilia, Serpentes and Amphisbaenia. The suborder Lacertilia refers to lizards; the suborder Serpentes refers to snakes and the suborder Amphisbaenia refers to worm lizards. The crested gecko is considered to be a lizard and as such it is in the suborder Lacertilia. The suborder Lacertilia is simply a scientific name used to refer to lizards. This suborder consists of some 3,800 species that can be found on every continent of the world with the exception of Antarctica. This wide-ranging group of creatures is most often characterized by the presence of limbs and external ears that set them apart from snakes that share the movable quadrate bone that characterizes creatures in the order Squamata. Many members of the Lacertilia suborder are recognized for their autotomy, the ability to release their tail in an attempt to escape predation; however, this characteristic is not true for all reptiles in this suborder. Reptiles in the Lacertilia suborder are also commonly known for having well-developed color vision which enables them to hunt fast-moving insects and smaller fast-moving prey items. These creatures are also known for communicating through the use of body language which relies upon sharp sight to be successful.Creatures within this suborder range in size considerably with the largest lizard being the Komodo dragon which measures in at some 9 feet 6 inches long! Creatures within the family Gekkonidae are most commonly recognized as being “geckos.” Reptiles within the family Gekkonidae range in size from just over half an inch to two feet long! There are believed to be over 2,000 known species of gecko species in the world; however, the small size and reclusive behavior of many of these species seem to indicate that many more varieties are yet to be discovered. Reptiles in the Gekkonidae family are most often found in warm climates and are recognized for making unique vocal sounds that are not seen in other lizard families. There are many characteristics that set lizards in the Gekkonidae family apart from other lizards including a lack of eyelids (although the Gekkonidae subfamily Eublepharinae is the exception to the rule) with a clear membrane instead that keeps the eye protected. The gecko is able to lick this eye membrane in order to keep it clean. The toes of the Gekkonidae species are also a particularly well-recognized feature in that they are so specialized that they allow these nimble creatures to climb smooth surfaces with ease. Gekkonidae species are also notorious among those who study them for the expulsion of feces or foul-smelling discharge when they are threatened. In combination with the ability to drop their tails, this makes the Gekkonidae a rather surprising prey item for many predators. The largest of all Gekkonidae species is the Kawekaweau that measured some 24 inches long that lived in New Zealand. It is believed that the Kawekaweau is now completely extinct having been wiped out in the late 19th century as new predators were introduced to the island. The smallest of all Gekkonidae species is the Jaragua Sphaero and is .63 inches long. The Jaragua Sphaero can be found on a tiny island just off the coast of the Dominican Republic. The genus Rhacodactylus is recognized as being a genus that includes medium to large geckos and each of the species that is classified in this genus is found in the New Caledonian islands. Lizards that are found within this genus are characterized as having particularly long limbs in comparison to other geckos as well as having toes that have well-developed lamellae. Lamellae are closely spaced plate-like structures that are very thin and provide traction on smooth surfaces that enable the gecko to climb walls and even ceilings! Lamellae are not only found on the feet of the Rhacodactylus but they are also found on the prehensile tail that is used to help these creatures in climbing trees. Rhacodactylus geckos are known for being arboreal species and so the prehensile tail is particularly useful in this instance. Rhacodactylus lizards are nocturnal egg layers (although the Rhacodactylus trachyrhynchus is the exception to the rule) and they are also known for being sexually dimorphic. Rhacodactylus ciliates or the crested gecko is also recognized by the scientific name Correlophus ciliatus. This unique looking species was once thought to be extinct until it was spotted once again in 1994. While the crested gecko is no longer believed to be extinct it is currently a species that is threatened by endangered status and as such it is protected by the Convention on the International Trade in Endangered Species of Wild Flora and Fauna. What Does the Crested Gecko Look Like? The most recognizable feature of the crested gecko is the appearance of eyelash like projections above the eyes, as mentioned previously. These eyelashes protrude above the eyes that feature on either side of the crested gecko’s wedge-shaped head. The head of the crested gecko features a crest (hence the name) that travels from the midpoint of each eye to the center of the back and then runs down the tail. The crested gecko is covered in small setae or hairs that appear on the end of the tail as well as the toes, these setae are composed of small spatula or hairs that allow the gecko to climb on various surfaces. While the toes of the gecko play an important role in the gecko’s ability to climb, when the toes are not able to adequately grip a surface the small setae allow for traction. The crested gecko comes in a variety of colors but they are most commonly recognized for being an orange color. These geckos can also be gray, red, brown and yellow and have a number of different markings that can appear as spots, tiger stripes or straight stripes. To date there has been no evidence that these markings or colorations are indicative of the gecko’s geographic location or familial traits. Where Can the Crested Gecko be found? The crested gecko is found in New Caledonia like all species of the Rhacodactylus genus. More specifically the crested gecko is found in the south province of New Caledonia. To date, there are three recognized populations of crested geckos that can be found on the Isle of Pines and Grand Terre island. Two of the crested gecko populations can be found on the Grand Terre Island, however they are distinct populations with one being located near the Blue River and the other being located near to Mount Dzumac. The crested gecko is a mostly nocturnal gecko that prefers to live in the trees of New Caledonia. During the daytime these geckos can be found sleeping in the rainforest trees; however, at night these reptiles are found hunting for food. Interestingly the colors of the crested gecko become much brighter during the night. Like many lizards the crested gecko will drop its tail when it feels threatened by a predator; however, unlike other reptiles this gecko does not re-grow its tail once it is lost. One thing that tends to disturb many first time owners who experience their gecko dropping its tail is that when the tail is dropped it may continue to move for as long as five minutes before appearing “dead.” It may seem painful for any animal to lose an appendage particularly one that will not grow back; however, the tail loss process for the crested gecko is quick and relatively bloodless. After losing their tail the crested gecko experiences no considerable problem living both in the wild and in captivity as tailless geckos. In the wild, the crested gecko is an omnivorous gecko but is also referred to by some as being frugiverous. This gecko feeds on a diet that is composed mainly of insects and fruits. A good complete crested gecko diet consists of pangea or repashy and about 2 appropriately sized crickets or other insects every 2 weeks (except mealworms). An additional tip from our reader is to dust the insects with a D3 and Calcium dust. The insects should be no larger than the distance between your geckos eyes. It is illadvised to feed geckos fruit flavored baby foods because they are so sweet and carbohydrate loaded. It is also recommended when keeping crested geckos in captivity that they are provided a calcium supplement. Keeping any type of reptile generally involves applying a calcium supplement because of the lack of calcium found in their natural diet so doing so for the crested gecko is not unusual. Crested geckos can be voracious feeders and often can consume as many as five live prey items in a single feeding. Crested geckos are a favorite among lizard lovers for a number of reasons including their long life span and their unique appearance. When keeping a crested gecko however, it is important to ensure that the right provisions are made to ensure that the gecko is kept happily. It is suggested that the minimum enclosure size for a crested gecko is around 1 foot long by 1 foot wide by 2 feet high. This may sound like an unusual format for a reptile tank but it is important to understand that these particular geckos are arboreal in nature and as such they prefer taller enclosures in which they can climb. Crested geckos are relatively easy to keep happy in an enclosure as long as they are provided with areas to hide during the day in addition to enough height to allow them to climb. Of course, temperature and humidity are also significant factors in how happy a captive crested gecko will be. The ideal temperature for a crested gecko enclosure is between 70 to 85 degrees Fahrenheit. Since this temperature range is generally the temperature of a home these geckos do not require additional heat sources unless you live in an area that is below this temperature range. The humidity of the enclosure should be kept between 50 to 80 percent since these geckos prefer rainforest type ecosystems. This range of humidity can be maintained by misting the geckos every evening when they begin to become active. Providing a proper substrate is also important in helping to maintain proper humidity. One type of substrate that many crested gecko owners prefer is orchid bark since it retains moisture and boosts humidity since orchids also thrive in high humidity subtropical environments. 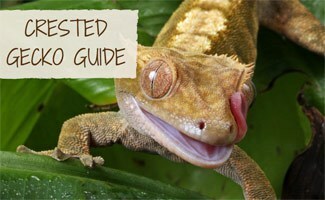 When deciding to keep a crested gecko it is important to understand the social nature of this reptile. The crested gecko is primarily a solitary creature. However, it can be housed with one or two other geckos providing that they are matched appropriately. The most successful matches are between a single male and single female of the species. It is believed that when they are kept in a happy environment and provided health care when necessary, that the crested gecko can thrive and live anywhere from 15 to 25 years in captivity! These are hardy creatures with relatively few needs but it is important to provide the minimal necessities to this unique gecko species in order to have it live a significant lifespan. Jungle Bob shares some pretty fun facts about this relatively new species of reptiles. Watch this three and a half-minute video to learn more about these little guys. The crested gecko is an important part of the New Caledonian ecosystem and it is important that conservation efforts to keep this species thriving in its natural habitat continue. It may seem peculiar to have a creature labeled as being endangered in the wild and yet being sold as a pet in commercial stores across the world but this situation is nothing new to the animal kingdom. While crested geckos may be thriving in the pet industry a number of factors are threatening this creature’s success in the wild of New Caledonia. Why should it matter if this single gecko were to become extinct? Just like any other species, the crested gecko plays an important role in its own ecosystem. Without this gecko species the insects that the crested gecko feeds upon would go unchecked, ants that feed upon the crested geckos may go unfed and as such the circle of life goes disrupted. It may sound trite but the idea of a butterfly changing the history of the world has never been as true as it is in the case of species preservation. The climate of New Caledonia is changing and the native species are suffering but it is the hope of the Convention on the International Trade in Endangered Species of Wild Flora and Fauna that by giving these small geckos protected status, they will be able to eventually bounce back. If numbers of created geckos do not begin to bounce back in their native environment it is possible that many more species of New Caledonia will also feel the impact and their numbers too will begin to dwindle. So now that you know more about geckos do you think a little differently about the Geico commercials? I am so happy i saw this, i thought my gecko was a different breed than crested! This article showed me how i SHOULD be taking care of my gecko, Thank you so so so much! Thank you for the guide, now I know how much to care for by on my gecko. Nova, no problem glad it could help you out! Sorry, but recommending either baby food or yogurt Is extremely ill advised and inadequate for the proper care of a crested gecko. Please amend this information. New owners should only be advised to feed a good complete crested gecko diet, such as Pangea or Repashy, and consider supplementing this with some crickets or other insect (except mealworms) that have been dusted with a D3 and Calcium dust, about 2 appropriately sized insects every 2 weeks. The insects should be no larger than the distance between your geckos eyes. Thanks so much for the insight into Gecko’s diets, we will make sure to update the information in the article to ensure it’s accurate, appreciate your expertise and advice! Thanks Amy, I have a crested gecko named Gary as a pet and although I live in a somewhat colder climate in the Northeast he stays plenty happy and healthy inside thanks to a small heat lamp I keep near his home. Another tip for those looking to get one of their own, having a warm mist humidifier in the room at night which substitutes for needing to spray. So long as your Gecko always has access to a small water bowl as well. No problem. Just got to make sure people receive the correct information when it comes to caring for an animal. Can I ask, how was the writer of the article selected for writing this piece? They seem to have some major gaps in their knowledge, and there is advice on here that would quickly kill a Gecko in captivity. I’m sure you would want that on your hands as a site…. Amy who originally wrote these articles is a bit of a reptile enthusiast which is why we chose her to write them, however again we appreciate you reaching out and giving us more accurate information for us to ensure it’s as factual as possible!